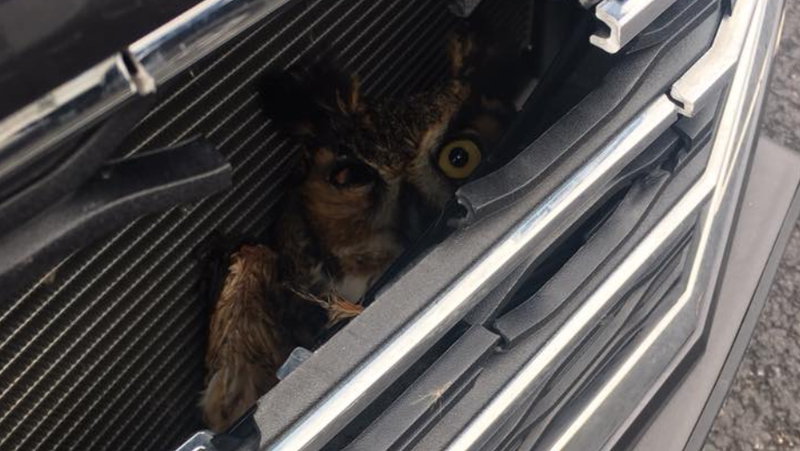 A great horned owl flew into the grille of an SUV driving in Virginia this week, riding some 160 miles before it was rescued. The owl, as you can see, doesn’t look very pleased. He’ll be all right, though, a local animal control agency said, even if he emerged from the grille a bit worse for the wear. And then, caged for its own safety. Before being let out to wander around a little. His right eye’s a little busted—probably because of a broken blood vessel, an animal control employee said—but, all in all, he’s looking considerably more chipper than when we first encountered. “We rarely get to see great horned owls up close and we’re so happy he will be OK,” Petersburg Animal Control and Care wrote on their Facebook page. The owl will now be sent to a rehabilitation center for recovery, Petersburg Animal Control and Care said. If you see an injured owl in the wild, the agency cautioned, don’t approach it, since great horned owls have sharp beaks and talons. Instead, call your local animal control. And, by God, if you suspect you might have hit one, maybe pull over and check.